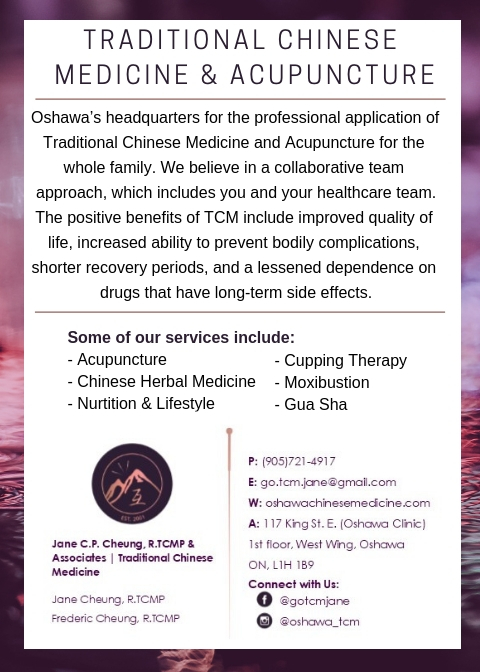 We are Oshawa’s headquarters for the professional application of Traditional Chinese Medicine and Acupuncture for the whole family. We believe in a collaborative team approach, which includes you and your healthcare team. TCM promotes well-being for individuals of all ages (yes, even kids). It is built on the premise that good health relies on the restoration and maintenance of harmony and balance by empowering the body's own healing abilities. The positive benefits of TCM include improved quality of life, increased ability to prevent bodily complications, shorter recovery periods, and a lessened dependence on drugs that have long-term side effects. Traditional Chinese Medicine (TCM) is a wealth of medical knowledge developed in China from over 4,000 years of observation, investigation, and clinical experience. The modalities used in TCM are both traditional and integrative: acupuncture, herbal medicine, gua sha, cupping, moxibustion, laser therapy, nutritional and lifestyle advice, Qigong, TCM orthopedics, laser therapy, and Tui Na. Depending on the individual’s case and the practitioner's intent and skills, one modality or a combination of modalities would be used to support the healing process of the individual.